From path 12 (“Attert”), this route crosses a region of the Grand Duchy that is less well known but no less interesting: having gradually climbed the foothills of the Ardennes, the route enters the Haute-Sûre nature reserve with its lake, which you can reach by taking a short ride from Koetschette and which offers a wide range of leisure activities including bathing, water sports, solar boat excursions and walks around the “Lake Circuit” providing superb views over sparkling waters in their niche of green. 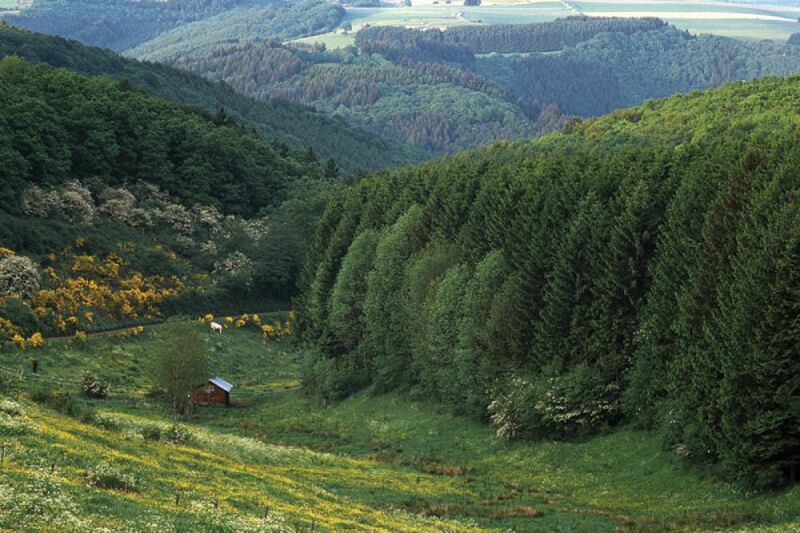 The nature reserve is also famous for its high-quality local products, such as teas, spelt wheat beers or the famous Ardennes cured ham. For another highly recommended detour from Koetschette: follow the route east for five kilometres, to the beauty spot known as “Napoleonsgaart”, and visit the church in the tiny hamlet of Rindschleiden nearby, with its remarkable 15th and 16th frescoes.